According to Transparency Market Research report, the global high resolution dispensing systems and equipment market is projected to rise at steady CAGR of 3.4% over the projected tenure between 2016 and 2024. If the market progresses at this growth rate, the market valuation will reach up to US$3.09 bn by the end of 2024. In 2015, the market earned US$1.8 bn. The demand for automatic dispensing systems that falls under the product category has gained huge attention and acquired a larger share in the market in 2015. Manufacturers developing automatic dispensing systems are using automatic variants due to its multiple advantages. Moreover, automatic dispensers help in preventing dispensing in wrong locations that encourages overall productivity, lowers the chances of part failure, and reduces cost. With respect to geography, Europe held dominant share in the global high resolution dispensing systems and equipment market 2015 and is expected to lead the market over the projected tenure. Increasing use of advanced technology and higher investments in the electronics industry strengthen position of this market. Moreover, Asia Pacific market is also projected to contribute in growing the global high resolution dispensing systems and equipment market. Integration of automation in various industries is the key driving factor behind the growth of the global high resolution dispensing systems and equipment market. In fact, the growing needs customization, accuracy, and control among the end-users is also expected to fuel growth in this market. Moreover, increasing employment of high resolution dispensing systems and equipment in various industries such as automotive, aerospace and defense, and oil and gas is also anticipated to provide a fillip in this market. 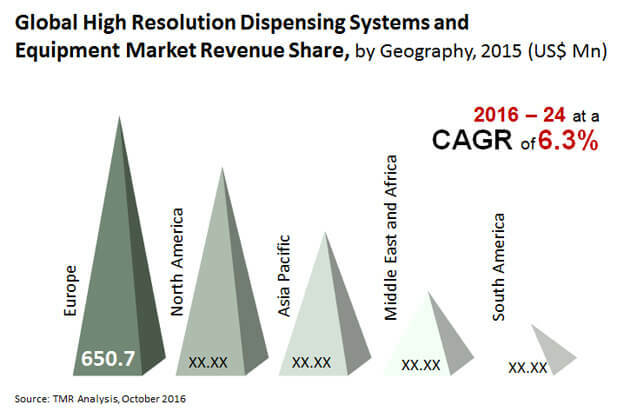 Adding further, growing use of high resolution dispensing systems and equipment in the electronic industry might also create growth opportunities in this market in the coming years. High resolution dispensing systems and equipment is used in electronic applications such as protecting, keting, and plastic holding to gain high accuracy and precision. As the cost of high resolution dispensing systems and equipment is generally higher than ordinary dispensing systems and equipment which might restrain growth in this market. This cost is increased due to innovation taking place in high resolution dispensing systems and equipment which overall increases the cost of products. Moreover, design limitations are also projected to restrict growth in this market. However, increasing demand for precision and accuracy might encourage the growth in the global high resolution dispensing systems and equipment market. The study presented here is based on a report by Transparency Market Research (TMR) titled “High Resolution Dispensing Systems and Equipment Market (Type - Semi-Automatic and Automatic; Application - Electronics (Adhesive and Sealant Dispensers, Glue Dispensers, Liquid Material Dispensers, and Powder Dispensers)) - Global Industry Analysis, Size, Share, Growth, Trends, and Forecast 2016 - 2024”.